Ofcom has announced how valuable airwaves will be released to meet the growing demand for mobile broadband, including new measures to safeguard competition. People and businesses increasingly need reliable, high-speed mobile broadband to support devices such as smartphones and tablets. Ofcom is helping to meet this demand by releasing extra spectrum, allowing mobile operators to increase their networks’ capacity. Later this year we will auction licences to use 190 MHz of spectrum in two ‘frequency bands’, increasing the airwaves available for mobile devices by almost one third. 40 MHz of spectrum will be auctioned in the 2.3GHz band. This band is already supported by mobile devices from manufacturers such as Apple and Samsung. These airwaves could be used immediately after release to provide extra capacity, meaning faster downloads and internet browsing for mobile users. The auction rules are designed to reflect recent market developments and safeguard competition over the coming years. 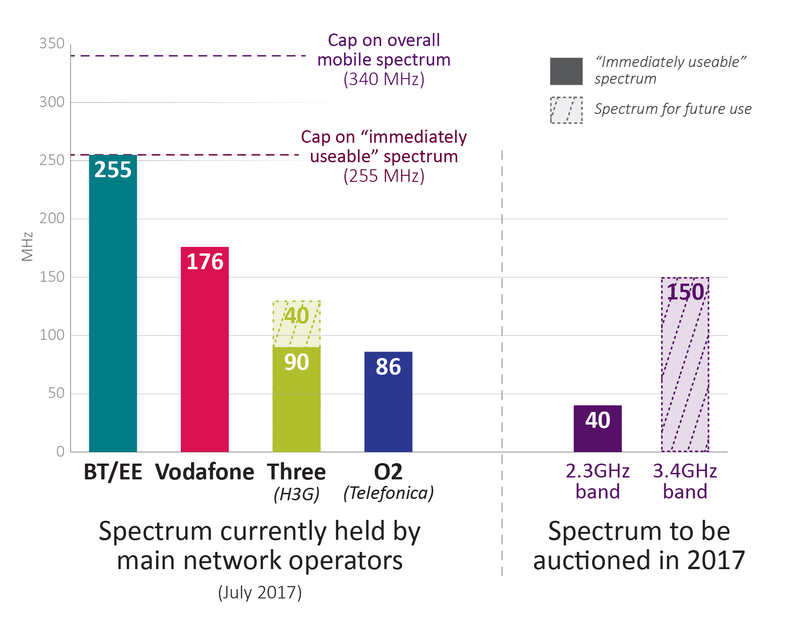 Taken together, the effect of the caps will be to reduce BT/EE’s overall share of mobile spectrum; the company can win a maximum 85 MHz of new spectrum in the 3.4GHz band. The overall cap also means that Vodafone could gain a maximum 160 MHz of spectrum across both the 2.3GHz and 3.4GHz bands. Based on today’s spectrum holdings, there will be no restriction on the amount of spectrum that any other bidder could win. continues to improve, and are making further spectrum available for mobile in the 700MHz band in 2020. This band is well suited for improving rural coverage and reaching deep inside buildings. It is currently used by Freeview TV and wireless microphones, and we will seek to place new coverage obligations on companies who win these licences at the next award. Changes in the availability of additional 5G spectrum. We had expected that an additional frequency band for future mobile services, including 5G – the 3.6GHz to 3.8GHz band – was likely to be available at around the same time as the 3.4GHz band becomes useable for mobile. We now have less confidence that it will be useable nationwide by that time. Therefore, releasing the 3.6 to 3.8GHz band cannot be relied upon to tackle competition concerns that arise from 2020. The new overall spectrum cap addresses these concerns. We still intend to make the 3.6 to 3.8GHz band available for mobile as soon as possible, and will shortly publish our proposed approach. It may be harder for networks to keep up with demand without more spectrum. Evidence shows operators with lower shares of spectrum cannot easily deliver more capacity by relying on other approaches, such as more masts. This means any large imbalances in spectrum ownership may present stronger concerns. This strengthens the case for both caps in the auction. We have also taken account of market developments that help the competitive position of some existing operators. Three now has more spectrum. After acquiring UK Broadband in February, the operator Three has access to 40 MHz of mobile spectrum in the 3.4GHz band, plus 84 MHz in the 3.6 to 3.8GHz band. Three and Vodafone have extra spectrum available in the near-term. Each holds 20 MHz of spectrum in the 1400MHz band, acquired in a trade from Qualcomm in 2015. This spectrum is now becoming useable for mobile and is being rolled out in Europe. These airwaves could be used by Three to improve its capacity in the near term, around 2018, before it can put its other spectrum to work. The UK benefits from four national network mobile operators, as well as numerous 'virtual’ operators who use the networks of the four national mobile operators to compete for retail customers. This competition helps ensure high-quality services, competitive prices, choice and innovation. Philip Marnick, Ofcom’s Spectrum Group Director, said: “Spectrum is a vital resource that fuels the UK’s economy. We’ve designed this auction to ensure that people and businesses continue to benefit from strong competition for mobile services. Many existing mobile handsets from major manufacturers, including the Apple iPhone 7, HTC Desire and Samsung Galaxy, are already compatible with the 2.3GHz spectrum. The band is so far being used for high-speed 4G mobile broadband networks in a number of countries outside Europe, including China, India and Australia. The 3.4GHz band is currently being used for 4G wireless broadband to fixed devices in some countries including the UK, Canada and Spain. Ofcom’s principal duty is to further the interests of citizens and of consumers, where appropriate by promoting competition. In doing so, Ofcom must secure the optimal use of spectrum. Immediately useable spectrum refers to mobile spectrum currently licensed in the 800MHz, 900MHz, 1400MHz, 1800MHz, 2100MHz and 2.6GHz bands and the 2.3GHz band available in this award. The mobile spectrum we expect to be useable in 2020 includes immediately useable spectrum plus 190 MHz in the 3.4GHz band as well as 80 MHz in the 700MHz band. However, the caps only apply to this award. We will assess the need for caps in future awards – including the 700MHz award – in due course, taking account of the outcome of this award. See Ofcom’s International Communications Market Report 2016. Today’s statement is published alongside two further documents: an Information Memorandum setting out details relating to the 2.3GHz and 3.4GHz band which may be of relevance to potential bidders; and a Notice with a proposed draft of the Auction Regulations, which will give effect to the decisions set out in the statement, in relation to the Auction design. Ofcom has set reserve prices of £10m per 10 MHz lot of the 2.3GHz band, and £1 million for a 5 MHz block in the 3.4GHz band. These are unchanged since Ofcom’s Statement in October 2015, giving a total reserve price of £70m for the 190 MHz of spectrum to be awarded. The auction is designed to be fair and transparent, enabling the spectrum to be awarded to those who are likely to put it to the most efficient use in the best interests of consumers. Ofcom will auction the spectrum in lots of 10 MHz for the 2.3GHz band and 5 MHz for the 3.4GHz band.